This antibody is expected to recognise both reported isoforms (NP_783195.2; NP_006522.2). Synthetic peptide corresponding to Human IFT88 aa 804-816 (C terminal). Our Abpromise guarantee covers the use of ab42497 in the following tested applications. WB Use at an assay dependent concentration. Predicted molecular weight: 94 kDa. IHC-P Use a concentration of 3 µg/ml. Western Blot: Preliminary experiments in human kidney, liver and lung lysates gave no specific signal but low background (at antibody concentration up to 1ug/ml). Involved in primary cilium biogenesis. Expressed in the heart, brain, liver, lung, kidney, skeletal muscle and pancreas. Cytoplasm > cytoskeleton > centrosome > centriole. Cytoplasm > cytoskeleton > cilium basal body. Ab42497 staining IFT88 in HepG2 cells by ICC/IF (Immunocytochemistry/Immunofluorescence). Cells were fixed with paraformaldehyde and permeabilized with 0.15% Triton. Samples were incubated with primary antibody at 10µg/ml for 1 hour. An Alexa Fluor® 488 secondary antibody was used at 2 µg/ml. 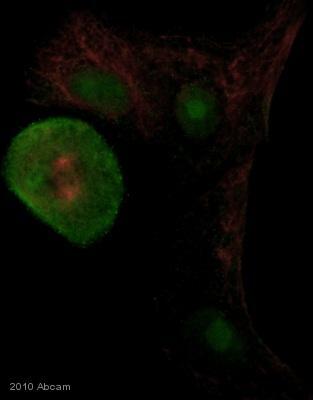 DAPI was used as a nuclear counterstain. An unimmunized goat IgG (10 µg/ml) was used for negative control. ab42497 (3µg/ml) staining of paraffin embedded Human Kidney. The tissue sections were subjected to antigen retrieval by microwave in Tris/EDTA buffer. The HRP-staining procedure was used for detection. ab42497 staining IFT88 in human prostate epithelial primary cells by Immunocytochemistry/ Immunofluorescence. Cells were fixed with paraformaldehyde and permeabilized with 0.5% Triton ×100. Samples were incubated with primary antibody (1/100:in DMEM w/ 10% FBS) for 1 hour at 200C. An Alexa Fluor ® 546-conjugated donkey polyclonal to goat IgG was used undiluted as secondary antibody. Publishing research using ab42497? Please let us know so that we can cite the reference in this datasheet.